Sarita’s Macaroni & Cheese, known as S’mac, is the first-ever restaurant to be devoted exclusively to mac & cheese. S’mac is a small, edgy East Village restaurant with high-traffic, high-volume, and a cult following. At S’mac, you can have a selection on either regular, multi-grain or gluten-free elbow macaroni. Your mac and cheese can be served with breadcrumbs if you desire. You order through an iPad kiosk and everything comes out in a cast iron skillet, which adds to the crisp. Buffalo Chicken Mac and Cheese in size nosh. On the menu, there is a wide variety of Mac and Cheese to choose from, that you will get confused about what you would want. 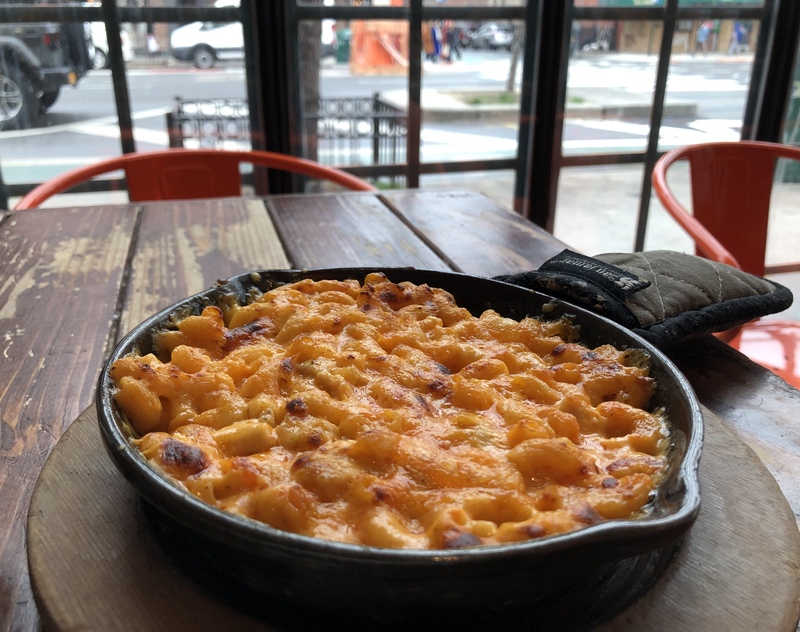 Either get the classic mac and cheese, which is the All American, or spice things up with their Malasa Mac and Cheese. They’re well known Mac and Cheese would be their Philly Cheesesteak, which includes Philly Steak, Sautéed green peppers and onions and your choice of cheese “White” (Provolone) or “Yellow” (American). Also La Mancha, which has a taste of Spain right at your fingertips! Flavorful Manchego cheese accented by fresh fennel and onions.Their Mac and Cheese is served in an iron skillet in different sizes nosh ($8.50), major munch ($11.90), mongo ($21), and partay! ($61). At S’mac, I got their Buffalo Chicken Mac and Cheese in size nosh. The buffalo chicken is cheddar and American cheeses with boneless chicken pieces and buffalo wing sauce. Then to top the Mac and Cheese off you can get it with crumbled blue cheese, but that’s your choice. The chicken was cooked well and the Mac and Cheese was cooked well too. The cheese just melted in your mouth and being a cheese lover I was really happy. “There are around a dozen variations on the menu. Also, the atmosphere is so friendly and chill that you have a great time while eating your Mac and Cheese,” said Rajvir Batra, a student at Thomas Edison. Want some good Mac and Cheese come down to S’mac. It will make you want to come back for more.